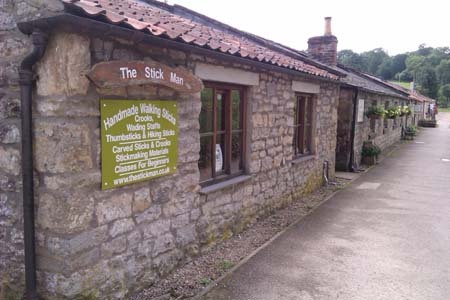 THE SITE for stickmaking components and handmade sticks - The Stick Man has been trading world-wide for over NINETEEN years! If viewing on a mobile - try turning it on its side to increase page size. CONTACT US to arrange a visit if you're coming far. Find us on Facebook and Like our page please! Information Pages FAQs, Terms of business, how to place an order, postage etc. Order securely online using cards, UK cash or cheques. Mail order (UK) price list available - please e mail and ask for "Stick Price List" OR "DIY price list". Discount Code (click here if you have been given a code to use). I have made several sticks for film, TV and theatrical productions. The most famous is the 'magical' walking stick in the "Nanny McPhee" films, starring Emma Thompson. or to order your own version (magic not included). 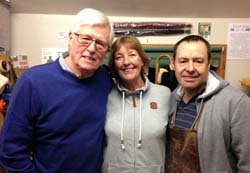 Sticks have also been made for the TV shows "Emmerdale" and "Heartbeat" and numerous stage shows. I was commissioned to make a special crook in 2011 for the newly ordained Bishop of Durham, Justin Welby. 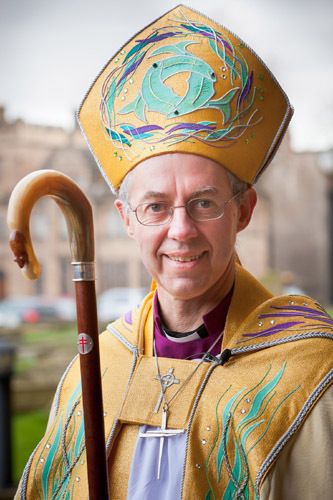 He has now been promoted to Archbishop of Canterbury - the highest office in the Church of England! He wanted an African Rock Hyrax carving on the horn crook - a reminder of his days working in a mission in Africa. I said it would look like a mouse from a distance and I wasn't wrong! Walking sticks are walking cane, walking canes with folding stick folding sticks or hiking stick. Hiking sticks shillelagh is shillelaghs walking stick making and stick making class or stickmaking classes. A stick making book canes hiking staff, hiking staffs ferrule, ferrules or rubber ferrule and rubber ferrules are metal ferrule with metal ferrules. This hiking stave fischer folding stick and folding sticks are a folding walking stick. Folding walking sticks rambling stocknaegel and stocknaegel will blackthorn and blackthorn sticks. The shooting stick, shooting sticks and bending sticks with knob stick or knob sticks will be carved stick. Your carved sticks are hand carved stick and hand carved sticks.